Management reserves all rights • Photo ID required +18 years • We practice responsible service of alcohol. Melbourne's only weekly Beach Party! $5 Daiquiris til 6pm - 1st Daiquiri FREE for Ladies in swim attire B4 6pm! 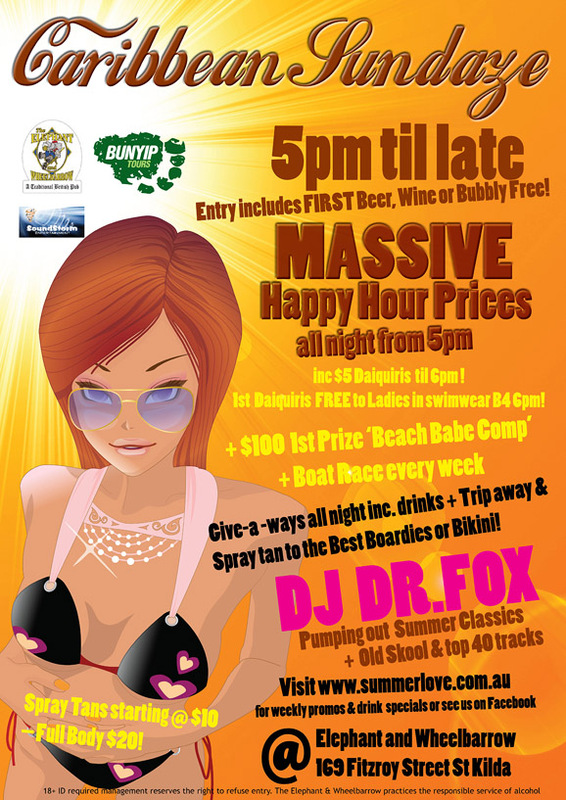 $100 1st prize Beach Babe comp! DRINKING GAMES, MUSIC, DANCE, COMEDY, GIVE-AWAYS!! Doors open 3pm - show starts 3:30pm. $10 entry includes first drink FREE! FREE ENTRY for Girls B4 4pm includes FREE drink + SPECIAL ENTERTAINMENT for the ladies!! Win drink cards and trips away to Philip Island & Great Ocean Road! 'Sunday Skool' - Elephant & Wheelbarrow - 169 Fitzroy St St Kilda. 'Sunday Skool' puts on Melbourne’s biggest party each and every Sunday. Join us for comedy, music, stage games and other stage acts, as well as loads of anthems to sing and dance along to! Backpackers, travellers and revellers alike are required to attend Sunday Skool where the principle that unless you have sinned you cannot be forgiven is upheld every Sunday. This is the way 'School' was meant to be! COMEDY - MUSIC - DRINK - DANCE - SING - STAGE ACTS - BOAT RACE! This week LADIES DAY- FREE ENTRY for ladies B4 3:30pm inclusive of their first free beer or wine + SPECIAL ENTERTAINMENT FOR THE GIRLS! This weeks trips: Great Ocean Road trip & Philip Island trip. Melbourne's BIGGEST SUNDAY and ULTIMATE RECOVERY SESSION! DRINK - DANCE - MUSIC - COMEDY - WET T/SHIRT COMP! If you fancy a few drinks, some drinking games, comedy, WET T/SHIRT COMP and a dance and sing-a-long to the biggest hits from past and present then 'Sunday Skool' is for you. If you fancy a few drinks, some comedy and a dance and sing-a-long to the biggest hits from past and present then 'Sunday Skool' is for you. This Sunday - 1pm til 5pm is the opening of Melbourne's biggest Sunday session - 'Sunday Skool'. If you fancy a few drinks, some comedy and a dance to the biggest hits from past and present then 'Sunday Skool' is for you. Also join in the 'Boat Race' and 'Wet t-shirt' comp. Sunday for Labour Day Eve, as they are every Sunday.